Cup or cone, cup or cone…my eyes darted back and forth, debating which to order. 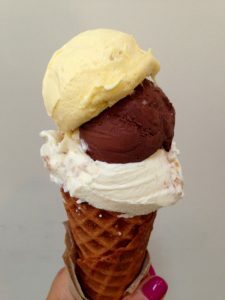 The artisanal gelato shop was known for their buttery, perfectly crisped, handmade waffle cones. A waffle cone with two heaping scoops of freshly churned gelato was my absolute favorite snack the summer I resided at an eating disorder treatment center in California. But on that particular afternoon, I was paralyzed by my restrictive habits. The fear wasn’t about the food this time, though—it was about the money. I had previously gone to the shop as part of a group snack outing which was paid for by the program. But this time, I was financially responsible. I was going to spend my own money on my own food, and this scared the bejesus out of me. I have experienced a significant amount of financial trauma in my life, and that summer I certainly was not what one would call “well-off” financially. But I was slowly—albeit with resistance—beginning to realize that I used these facts as a way to skimp out on nourishing myself. I had grown accustomed to not buying items I genuinely wanted, getting coffee or tea instead of meals with friends in order to save money, hoarding free food. What does THAT mean?! I balked. Jaw clenched and hips locked, my protectors lurched to attention, ready to guard against the offensive implication that my pragmatic approach to spending (and more often, not spending) money was anything but warranted. Over time—and with much writing, talking, and weeping—I worked to appease my protectors and let go of more and more behaviors. With fewer symptoms, I could shift my focus to examine what my protectors really needed. Because an eating disorder isn’t really about the food, just as an addiction to alcohol or drugs isn’t really about the substance. I was trying to care for my feelings and meet my needs with strategies that I felt dependent on, but that did not provide anything more than temporary and insufficient relief. Patterns of restriction, bingeing, and purging can manifest in anything, for anyone: food, movement, relationships, finances. We all employ strategies to meet our needs and care for our feelings, and not all of them necessarily work. Some are self-defeating. Some are avoidant. That is normal, and not something to feel guilt about. But it is something to be aware of, and take care of in a way that serves your wellbeing. What do I really need when I feel lonely? When I need to feel connection to someone? When I want to be comforted? Ultimately, the sense of safety, relief, or comfort we seek cannot be found by manipulating how we eat or how we spend. The part of me that knew that to be true stepped up that afternoon in the gelato shop: In the end, I chose the waffle cone. And though my hands trembled with anxiety as I handed over the cash and received my purchase—my little protectors were dismayed and terrified by this reckless decision!—I still was able to delight in the creamy gelato nestled inside that heavenly, buttery crunch. Perhaps, part of me mused, it was actually the best I had ever tasted—for it was rich with the incomparable ingredient of my commitment to recovery. Blog post written by Annie Robinson, Narrative Coaching Specialist at Eating Disorder Recovery Specialists.